The bowl was occasionally used to collect money or to hold drink, but usually was a token decoration. In some cases, a small Christmas tree was placed in the bowl, held upright by metal supports. 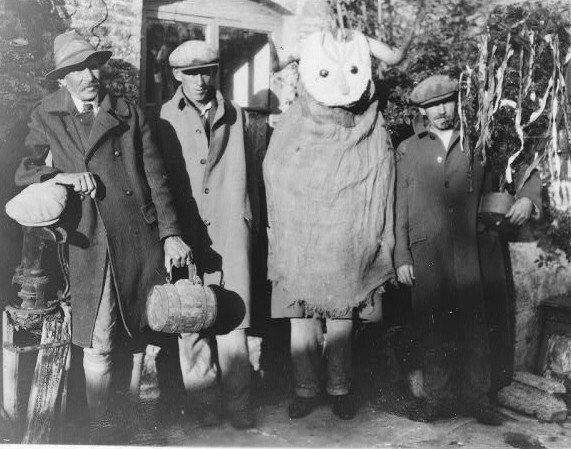 Furthermore, in a few villages further south in the county, the wassailers would also carry an effigy of a cow or bull, referred to as the Broad or Bull. The Broad might be a 2-dimensional stylised face with horns and a piece of sacking hanging down or it might have been something as simple as a hollowed-out swede with a candle inside. The wassailers would arrive and sing their song, perhaps with a few other seasonal pieces, and then be given money, food or drink in return. Nearly every village in the south of Gloucestershire and even into Wiltshire had their own version of the custom and the song, many of which have been collected, but no one version can be considered as the ‘original’. The song was often called The Waysailing Bowl and the pronunciation ‘Waysail’ must have been the pronunciation that Sharp and other collectors heard but they chose to note it as ‘Wassail’. We have adopted the spelling Waysail as more reflective of the actual pronunciation. A version of the Gloucestershire wassail song was printed in the Oxford Book of Carols in 1928, the tune of which was collected by Ralph Vaughan Williams from a Gloucestershire person in Pembridge, Herefordshire, who collated the tune with words collected from William Bayliss of Buckland and Isaac Bennett of Little Sodbury. This version of the carol has become popular worldwide and is sung today by many singers and choirs. Apart from the versions on this site, the song and custom has also been noted as exisiting in Avening, Kemble, Leighterton, Oaksey (Wiltshire), Randwick, Sherston (Wiltshire), Slimbridge and Tresham. Some of these versions have been collected and where possible will be added to the site in due course. A distinctive wassail song exists from Brockweir. Bisley Wassail sung by American Group ‘Nowell Sing we Clear’, with their kind permission. 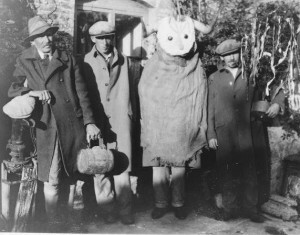 Of recent years, and driven to some extent by the folk revival, morris dance sides, etc, there has arisen a new manifestation of wassailing in Gloucestershire, not based on the old Gloucestershire traditions but rather on traditions carried out in other counties, such as Somerset and Devon. In this version, rather than a group of people ‘going wassailing’, entities such as farms will hold a wassail event. This usually consists of blessing the trees in an orchard, especially cider apple trees, firing shotguns in to the branches and reciting short wassail rhymes. This is followed by general merriment, singing, dancing, eating and drinking and a good time is had by all. Such wassails are held these days in Maismore, Wick Court (Arlingham), Hayles Fruit Farm (near Winchcombe), Tytherton and St Briavels. For more details on the history of the word and custom of wassail, see here.